The work was done at the Chemistry of Condensed Matter group led by Prof. J.J. Kelly, in close collaboration with Dr. W.L. Vos and drs J. Gómez Rivas of the Waves in Complex Media group of the University of Amsterdam, which was led by Prof. A. Lagendijk. Supervisors were Prof. J.J. Kelly and Dr. D.A.M. Vanmaekelbergh. Gallium phosphide is ideal for investigations into Anderson localization of visible light because of its high refractive index, high electronic band gap, and the fact that pores with diameters of a few hundreds of nms can be made relatively easily in this material. 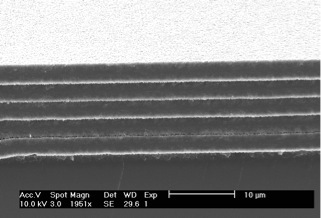 It is easy to tune the photonic strength of porous GaP in a wide range by controlling the density and size of the pores. We investigated the formation of porous GaP made by electrochemical etching in sulfuric acid solutions. 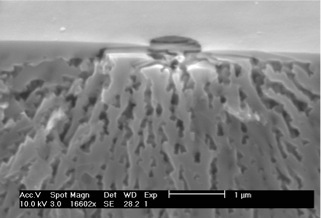 The etching starts at specific pits at the surface, from which the pores radiate. This leaves a thin top layer of bulk material. At high potentials an oxide layer is formed that slowly dissolves in the electolyte. This makes the formation of multilayered porous GaP possible. Detail of a pore in porous GaP. The pores start at specific sites at the surface and radiate outwards, leaving a thin layer of bulk material. Layers of porous GaP, made by sweeping the potential from low to high and back during etching.